This week I’ve been looking at birds, so I thought I’d share the joy with you. Do you have any thoughts about what this might be? I expect that quite a few of you will have a pretty good idea, so please keep your suggestions cryptic, to let people who are less familiar with avian identification have a chance of improving their skills. It’s petty distinctive, so I expect someone will know what it is, but I’d be delighted to hear your thoughts. Have fun! The other Friday I gave you this specimen to have a go at identifying, but alas when the time came to write an answer I was at the Natural Sciences Collections Association (normally just called NatSCA) conference (which has been referred to as “the highlight of the natural history curator’s year”) and as a result I didn’t get much of a chance to write an answer or even read the comments. This specimen has a somewhat thrush-like appearance, but the hooked tip of the bill doesn’t quite sit right for a member of the Turdidae (the family of true thrushes). This somewhat raptorial feature of the beak is seen more in birds like the Laniidae (shrikes) and some of the Saxicolinae (chats). It’s the chats that I’m interested in with regard to this specimen, although not the “typical” chats. The ones I’m interested in have been moved around taxonomically a fair bit. A lot of birds with a thrush-like general appearance will have been called a “something-thrush” by Europeans and will have kept that in their common name even after taxonomy has moved on and that species has been moved out of the Turdidae. In the Saxicolinae there are a lot of birds that were once considered thrushes and one genus in particular tends towards being a fairly dark colour with blue elements – Myophonus or the whistling-thrushes. The distribution of glossy blue feathers on members of Myophonus is variable and reasonably distinctive. Also, because these glossy feather colours are structural, they don’t tend to fade in old museum specimens like the colour from pigments. In this specimen the blue patch is fairly dull and confined to the shoulder (or epaulet) and the rest of the plumage is even more dull – possibly faded, but also possibly because it’s female (we all know that it’s usually the boys that are show-offs). Keeping in mind the distinctive bill, overall size and pattern of colouration, a trawl through the epic Del Hoyo, et al. 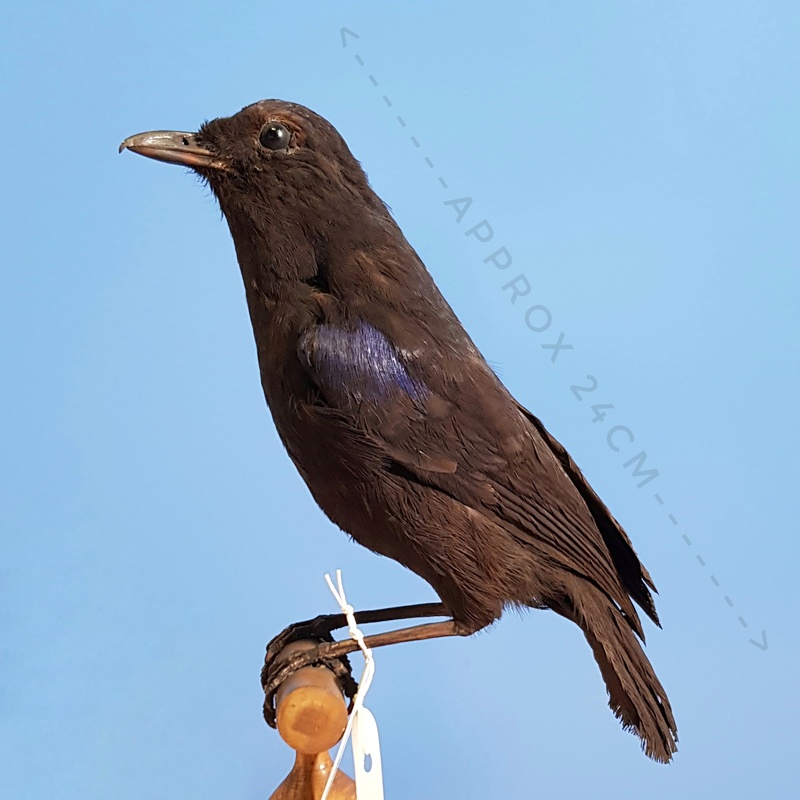 Handbook of the Birds of the World -Volume 10 yielded one description that fit rather well – that of the female Javan Whistling-thrush Myophonus glaucinus (Temminck, 1823). These forest dwelling birds live in, you guessed it, Java. They feed on various invertebrates and frogs, a slightly ramped-up diet from thrushes, necessitating a hooked bill tip to keep the more jumpy morsels from getting away. More mysteries to come this Friday! This Friday I have a feathery object for you to have a go at identifying. I stumbled across this specimen in the Dead Zoo stores and noticed it didn’t have a species identification (and the genus name also looked dubious to me). Any ideas what species this might be? As usual, you can put your thoughts, questions and suggestions in the comments box below. Cryptic clues are fun, poems are delightful but I do love a short story, so if you want to include the identification in a bit of short prose please give it a go! It’s not the easiest item to identify for a variety of reasons. First of all it’s broken, only showing one end and probably missing quite a lot of the element. Next, the images don’t show all of the angles you might want to see and because the object is small the images aren’t as clear as you might like. However, there are a few angles visible (see below) and there is a scale, so the main requirements to get an approximate identification are in place. I say approximate, because with something like this I think you really need the object in your hand where you can compare it to other material in detail if you want to make a confident identification. The first thing to note is that the bone is hollow with thin walls. This rules out fish, reptiles, amphibians and mammals (including humans jennifermacaire ) – leaving birds. Weathered mammal bones may have a void in the bone where the marrow would have been, but the cortex (outside layer) will be thicker and near the articular surface it tends to be quite solid. As far as I recall (mentally running through images in my head) both ends of the proximal limb bones in tetrapods have convex ends? This is accurate, but while the proximal (near end) of the limb bones are convex, the more distal (far end) limb bones tend to have concave ends, so that helps narrow down what this bony element might be. For me the give-away here is the fact that there’s no ridge within the concavity of the articular surface, which means that it will allow movement in several directions – something that the bones of bird feet don’t really need, which is why bird lower legs, feet and toes have a raised ridge inside the articular surface that corresponds with a groove in the other surface, keeping the articulation of the joint tightly constrained. However, bird wing need to make a wider range of motion (at least in some species), so the mystery object is most likely the distal end of a bird radius (the ulna tends to have a hook at the distal end). This is the conclusion that Wouter van Gestel and DrewM also came to (joe vans should’ve stuck to his guns). Identifying the species of bird is a lot more complicated. The size suggests a pretty big bird, which narrows it down and the locality in which it was found makes some species more likely than others. I took a look at the radius of some species that are commonly found on the coast, like Guillemot, Herring Gull, Duck, Cormorant/Shag and Gannet, Skimmer, Pigeon and I also checked out Chicken, since their bones are probably the most commonly occurring on the planet. Many of the species I checked had quite a distinctive structure around the distal radius articulation, but the gulls, ducks and chickens that I looked at had fairly unremarkable distal radius articulations, making it hard to definitively decide what the mystery object is based on the images. So with that somewhat disappointing conclusion I admit partial defeat, but I can say that it’s not from a Cormorant, Shag, Gannet, Pigeon or Guillemot. Sorry I can’t be more specific Annie! Unfortunately that’s just how the identification game works sometimes… we’ll try again with something new next week!